When John Daly was at his wildest and winning in the early 1990s, picking up two majors in the process, his rebel streak appealed to many people, including myself. 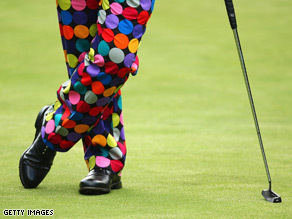 John Daly shows off his latest pair of brightly colored pants. It was proof that honors in sport could be achieved without the strict dedication and often bland existence some players live in order to achieve their goals. Following Daly around the greens and in the news was entertaining. A lot has been changed since then; four marriages break downs, bank accounts busted, spats with Butch Harmon - one of the world's leading coaches - and the PGA tour taking back his card after he was found drunk outside a Hooters bar. The joke should be over! Sadly though, as he's running out of options and new material to create headlines, the pants at Wentworth have increasingly become the best way forward. Not that Daly is plowing a lonely furrow here. Darren Clarke has been known to cut a dash around the tee as has Ian Poulter with his garish garb. Henrik Stenson even took his off! All three are well respected among the fans and players and have solid world rankings. They don't have to push for headlines as they often come with top performances. Daly's grab for attention seems different, the joke without the performance. A sad continuation of a trend that saw him sit out in front of the Masters crowd at Augusta this year to sell memorabilia for some extra money. He's currently ranked 452 in the world -- which may improve as he made the cut at Wentworth -- so why can't he focus solely on getting inside the top 100 -- that would make a great headline or is that too much like hard work? 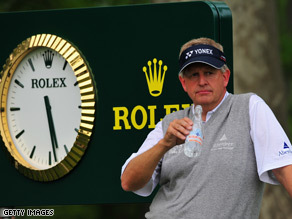 "He is a walking train wreck and I guess people turn their heads to watch the train wreck," said Stuart Appleby when he found out that Daly had received an invite to play in the Australian Masters. Interesting thought.